The necklace may be the oldest form of jewelry, but earrings aren't that far behind. In ancient Egypt and Babylon, both men and women pierced their ears. Otzi the Iceman had pierced ears, as did Julius Caesar and King Tut. Earrings have kept their place as jewelry for the ages, even with the proliferation of new styles and types of earring findings. Which you choose depends on the job you intend it to do. Get some history on earring findings and what kinds of designs they're best suited for. Hoop and hoop-style earrings were worn as far back as the Bronze Age, in cultures around the world. Hoops were worn to protect the ears from evil spirits, announce social superiority, flaunt or store wealth, indicate servitude and a variety of other reasons. This eternally popular style has been made out of almost everything under the sun, including gemstones, glass, acrylic, metals and organic materials. Hoop earrings were traditionally a circle or half-circle, usually with a wire that passed through a piercing in the lobe that secured one side of the hoop to the other. The wire could be bent or latched to close. Hoop earrings are now available in a wide variety of sizes, materials--even shapes! 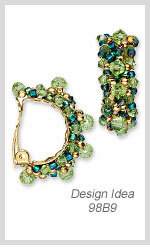 Hoops can be found in triangular, rectangular, square, oval and more. Modern variations include the post hoop (a hoop mounted to an earstud-style post and secured with an earnut) and the continuous/endless hoop (where the wire latches by self-inserting into the open end of the tubular hoop and held in place by tension). The traditional circular hoop shape can be found in a range of sizes, from the understated earlobe-hugging small loop to huge bohemian-style hoops festooned with crystals and drops. The hoop is as popular in the Information Age as it was in the Bronze Age. Unadorned hoop earrings are frequently worn in secondary ear piercings, in facial piercings and as body jewelry. Hoops can be embellished (as seen in image) and hoop earring components offer a multitude of design opportunities--some of which edge into chandelier earring territory. Hook and hook-style earwires are one of the earliest forms of earrings, used as early as Roman times. Other styles were introduced during the Victorian era, and up through modern times. Hook and hook-style earwires include styles such as the old-fashioned shepherd's hook (with its front ball or loop), the kidney earwire (with its built-in latch for added security without added weight), the perfect balance (with angular fronts to help prevent "tip-out"), the standard fishhook (with its coil or ball--or both!) and more. The fishhook is a relative latecomer to the party but has become the most commonly used of the earwire styles. 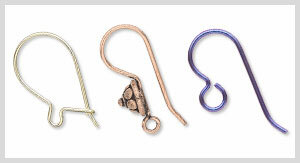 Hook and hook-style earwires offer an extremely wide range of materials, sizes, styles and weights. This ear finding is the most popular, and jewelry makers experiment with it frequently. The variety of wire weights used to create earwires allows for extremely lightweight designs, especially when combined with wood, acrylic or fiber components. Drop earrings are the most popular variant using this earwire type. The leverback or hinged earwire has been seen on earrings dating from the 1880s. Immensely popular in European jewelry, the leverback recently made a transition to the North American market. It is growing in popularity due to its low profile, sturdy construction and additional security. This earring style is immensely popular for fine jewelry in gold and silver as the leverback design helps prevent earring loss. The leverback is designed to snap tightly over the wire without causing discomfort to the wearer, yet remaining comfortable to use. The leverback is available in multiple styles; some have attached or dangling embellishments, some have single preset stones--some have both. Other leverback styles are equipped with loops for attaching dangles and drops, pegs for half-drilled pearls and beads or empty settings for cabochons and faceted gemstones. The leverback is an alternative to kidney wires that is just as secure and significantly more comfortable, due to the thickness of its manufacture. Its increased per-item cost makes it ideal for higher-end designs. During the early 20th Century, the clip-on and screwback earring findings were invented, meaning women no longer had to pierce their ears to wear earrings. In some circles, ear piercing was considered barbaric, gauche--even unsanitary. 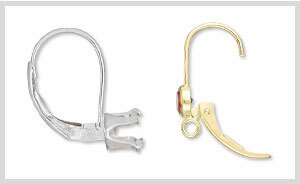 While "clip-on" describes a specific style of earring, there are other styles in this category: earclips, screwbacks, spring hoops--even magnetic earrings. Many findings include pegs, holes, loops and more to create the same fashion opportunities that exist for pierced earring wearers. Popular alternatives to pierced earrings also include ear cuffs and ear frames. 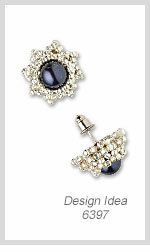 Clip-ons, earclips and screwback earring findings allow designers to create comfortable styles for non-pierced ears. There are also hoop earring styles which use spring-loaded pressure to keep the earring on. Clip-on and earclip styles have also been used to create shoe-clips or shoe roses--interchangeable embellishments for footwear. 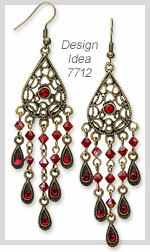 Chandelier-style earrings have been popular in India and the Middle East for thousands of years, yet first appeared in western fashions during the 1920s. After decades in the shadows, they recently re-emerged into the limelight and are more popular than ever. Worn during the day for a casual, Bohemian look, chandelier-style earrings easily transition into evening and after-work events. Chandelier earring components are the hoops, loops, filigree and wire components supporting the dangles, chains, sparkling crystals and drops. 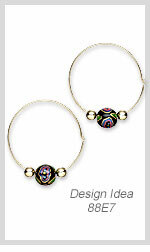 Find them in a variety of metals, finishes and designs to create dazzling designs. This style closely resembles miniature versions of the chandelier it's named after, with a series of embellishments that drop down--sometimes cascading to different lengths--creating tiers. These tiers create movement and, in many cases, create additional sparkle and shine. Also called earthreaders, threader earrings and similar names, this new earring form was created in the 1970s and professional manufactured in the early 2000s. It consists of a short post merged with attached chain; the chain threads through the ear piercing. The post serves as a "needle," allowing the chain to be threaded front-to-back through the ear. 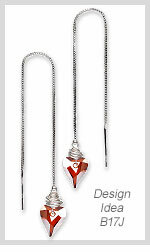 Includes a variety of metals, chain lengths, chain types and embellishment styles. Ear threads can be embellished to create long, lean earrings that sway with every movement. Some variations of ear threads include loops for adding drops; cups and pegs for adding half-drilled beads or half-drilled pearls; and recognizable shapes such as spirals, crosses and more. While post styles of earrings were worn by the Etruscans before the rise of Rome, the post or stud style of earrings we know today were first commonly available in the 1920s. Since then, the earstud/earpost component has been available in a variety of metals and finishes, ranging from empty mountings to pre-set with gemstones. Stud earrings are defined as an embellishment secured on the end of a post, which penetrates straight through the ear and fits close to the earlobe. The post is held in place by a removable friction back or tension clutch. Stud earrings appear to "float" on the earlobe without a visible point of connection. Earstud components can be enameled, painted, embossed, engraved or otherwise embellished. Other styles include recognizable shapes (such as spirals, crosses, animals or more) as well as cups, pegs or flat pads for adding half-drilled beads, pearls or cabochons. Some variations of the earstud or post component include loops or holes for creating earrings with drops. The post can also be threaded, allowing a screw back to securely hold the earring in place--a style more popular in Europe than in North America. Post or stud earrings can carry heavier embellishments than many wire styles, due to the thickness of their construction and their closeness to the lobe. Post-style earrings, especially styles without drops or loops, do not tangle in hair, collars, bridal veils or other hair treatments and keep attention at the cheekbones. One of the most popular styles is the ball post, which has a small metal ball on the front of the post, as an embellishment. The half-ball gives the appearance of a ball post yet has a lower profile and often less weight than an equivalent sized ball. Some variations of half-ball and ball post earring include loops for creating earrings with drops. The plain styles are commonly used as starter (also called "sleeper") earrings, with their smooth surfaces easy to wear in newly pierced ears. With the development of the modern post-style earring came the need to prevent it from falling out. The "butterfly clutch" earnut was used as early as the 1920s, while barrel style earnuts were first patented and used in the late 1940s. Tips for choosing the proper earnut for your earring finding. Create stud earrings with Sure-Set™ or Snap-Tite® earstud settings and faceted gems, and classic pearl stud earrings using half-drilled pearls and earring components with a cup and peg. Huggies are a popular style of non-pierced earrings where the setting actually "hugs" your earlobe. A hinge is located at the top of the earring that allows the post to open and close without an earring back. Many times, stones are channel set in huggy earrings. Sleeper earrings (also known as starter earrings) are designed to be comfortable when worn for long periods of time and are generally small to prevent entanglement with bedding or hair. Because their small size makes them comfortable, sleeper earrings are sometimes worn at night to keep an ear piercing from closing. Common styles include studs with short posts or screw backs and small hoops. An ear cuff is decorative ring designed to be pinched onto the ear without need for piercing. Ear cuffs may be pinched onto any part of the ear, not just the earlobe. We would like to share some of the customer comments we received in response to the article "An Earring Finding Guide," as featured in an email newsletter. Please keep in mind that the comments expressed below are those of our customers and do not reflect the views of Fire Mountain Gems and Beads. "Hi, I discovered this article on the History of Earrings on Facebook. I always love to read about the history of earrings. Not much information out there on the subject. Thanks. I will enjoy reading it. Please do more articles like this. Fun and informative." "Would have preferred some historical documentation with the article. Didn't tell me anything I didn't already know." "I really like the earring history Thank you"